DJIA Today, Aug. 13, 2014: U.S. stocks rallied broadly Wednesday with weakening consumer spending largely ignored as investors grew more confident over a peaceful resolution in Ukraine. The S&P 500 Index saw a strong afternoon of trading, with all 10 of the sector indexes in the green. The index is now roughly 2% below its all-time high registered back in July. Confidence in Russia returned, with the Market Vector Russia ETF Trust (NYSE Arca: RSX) up roughly 1.5% on the day. Meanwhile, reduced consumer spending figures for July had an adverse effect on retail stocks this afternoon. Brent oil prices jumped back from their 13-month low, while West Texas Intermediate prices were relatively unchanged. Problems in Paradise: Global marine park operator SeaWorld Entertainment Inc. (NYSE: SEAS) saw shares fall by more than 30% after the company reported weak second-quarter earnings and problems emerged from a film that paints a negative picture of the firm's animal rights practices. 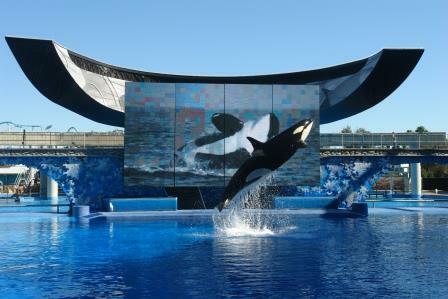 According to reports, animal rights activists have taken aim at the company in a film called "Blackfish," which alleges the firm has engaged in abuses of Orca whales at its parks. Solar Soars: International solar manufacturer Canadian Solar Inc. (Nasdaq: CSIQ) saw one of its highest trading-volume days ever as shares soared more than 24% after the company surprised Wall Street by beating second-quarter earnings and raising its profit outlook for the third quarter. The stock is up more than 150% in the last year. Death of Retail: A day after Kate Spade & Co. (NYSE: KATE) saw shares plummet 25% on concerns that U.S. consumers are demanding rebates and discounts on purchases, several other notable retail stocks fell due to concerns about 2014 sales outlooks. Most notably, Macy's Inc. (NYSE: M) saw shares fall more than 5% after it slashed its full-year same-store sales forecast. The cuts came on the same day the U.S. Department of Commerce announced weakened retail sales in July. Shares of Kohl's Corp. (NYSE: KSS) and Nordstrom Inc. (NYSE: JWN) both slipped more than 1% on the day. Shares of Kate Spade rebounded a little more than 7% from yesterday's decline. Nothing Runs Like a Deere: Shares of Deere & Co. (NYSE: DE) dropped another 2% this afternoon after the company slashed its 2014 sales outlook on falling grain prices. The company also announced lower second-quarter profits than expected and said that falling corn and soy prices are deterring farmers from investing in new machinery. The U.S. Department of Agriculture said that corn production across the United States is expected to reach a new record in 2014, which is having an adverse impact on prices and reducing sales and upgrades for companies like Deere.